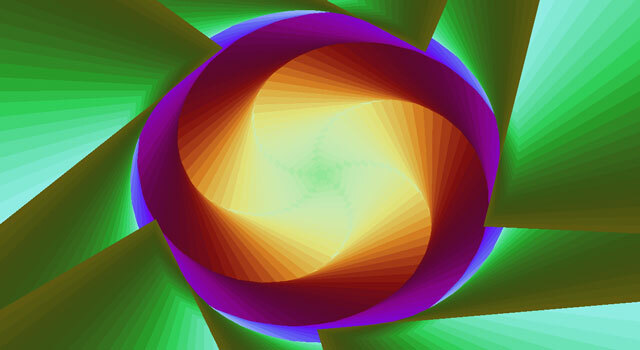 Whorld is a free, open-source visualizer for sacred geometry. 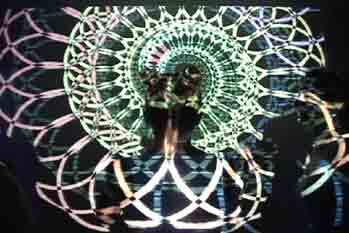 It uses math to create a seamless animation of mesmerizing psychedelic images. You can VJ with it, make unique digital artwork with it, or sit back and watch it like a screensaver. Whorld's visualization is controlled via parameters which can be adjusted manually, or modulated by oscillators. A given setting of the parameters and their oscillators form a patch. You can use the demo patches, or create your own. Patches can be grouped together in a playlist. You can play patches manually, or Whorld can auto-play them for you. Whorld also includes a crossfader, which allows you to interpolate between two patches (AKA "tweening"). Whorld is optimized for VJing. 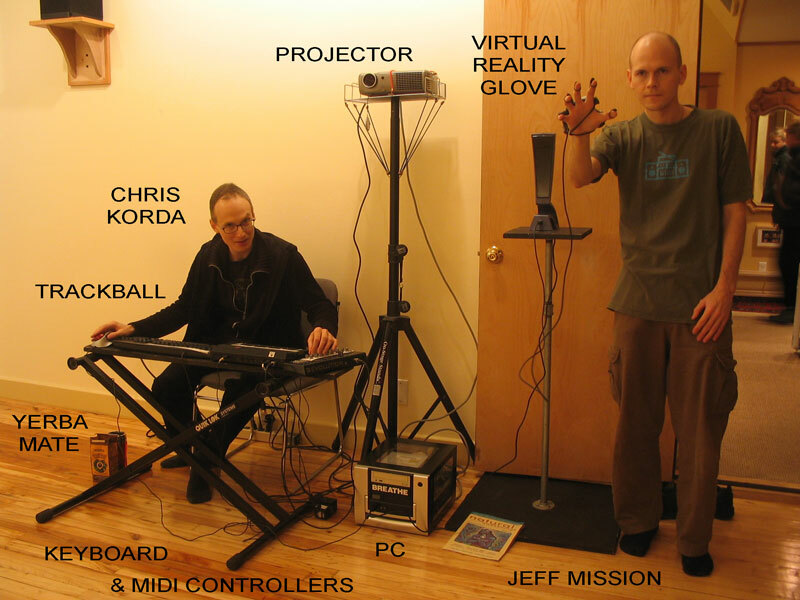 All of its functions are available in full-screen mode, via shortcut keys, mouse or trackball, and MIDI controllers. Whorld can be synchronized to music, using tap tempo, or MIDI clocks. Whorld dancers at Psyforia (photo: Ashanti), more here. Join the Whorld experience! See upcoming shows. Plasmagon is a cool new patch that generates Moiré patterns with Bézier curves. Try it! WiiWhorld Explained features the creators of WiiWhorld in lab coats, explaining what WiiWhorld is and how to use it. Somehow "Dr. Who" comes to mind. In the words of one viewer, "Hilarious, awesome, nerdy, scientific, informative, and right on!" Whorld 1.7 is available for download. This is the version you need for WiiWhorld! It adds global parameters which affect all rings at once, plus new Bézier curve parameters, and important bug fixes; for details, see the release notes. Similarly enhanced versions of the Freeframe plugins are also available for download: WhorldFF 1.3 and UltraWhorld 1.1. Chris Korda (developer of Whorld and FFRend) and Jeff Mission have been working on a project to control real-time, generative geometric visuals with the ever-popular Nintendo Wiimote. The project is called WiiWhorld, and a WiiWhorld demo video is now available. UltraWhorld is an enhanced version of the Whorld Freeframe plugin. It exposes nearly all of Whorld's parameters and switches to the host, allowing you to run Whorld from within your favorite VJ application without sacrificing real-time control. Version 1.2 of the WhorldFF Freeframe plugin is available for download. It adds support for 16-bit bit color and two new master settings; for details, see the release notes. Whorld 1.6 is available for download. It adds the ability to draw multiple Whorlds at once; for details, see the release notes. The Freeframe plugin crash in Visual Jockey Gold is now fixed. The bug could also affect other Freeframe hosts, so all users should download the latest version. Whorld 1.5 is available for download. It adds Video Overlay, and patch thumbnails; for details, see the release notes. Whorld will be featured at The Art of the VJ, June 15 at the Central Square Library in Cambridge. Next up is Firefly on July 1, and then Psyforia on Friday July 14. The Whorld Freeframe plugin is available for download. Please read the ReadMe. Whorld 1.4 is available for download. It adds Bézier curves, and patch modes; for details, see the release notes. Whorld will be featured at Psyforia, Friday May 19. Whorld 1.3 is available for download. It adds the Trail and Convex features, selectable zoom types, and a new oscillator waveform; for details, see the release notes. Wouldn't it be nice if the background could be video instead of a solid color? It's still in the alpha stage, but here are some sample images. Chris Korda will VJ at Movement of Sound in Springfield, on Wednesday April 19. New features are on the way! Trail gives each ring its own origin, allowing lifelike motion, and Bézier replaces the straight lines with curves! Here's a paper about the curve points. Whorld 1.2 is available for download. It allows master override of all oscillator properties, via MIDI; for details, see the release notes. Whorld 1.1 is available for download. It eliminates the movie export's 2 GB limit. Whorld will be presented at the March dorkbot in NYC. Whorld 1.0 is available for download. The beta version is ready to go except for the help file, which should be completed any day now. Whorld will be featured at Psyforia, Friday Jan 27.